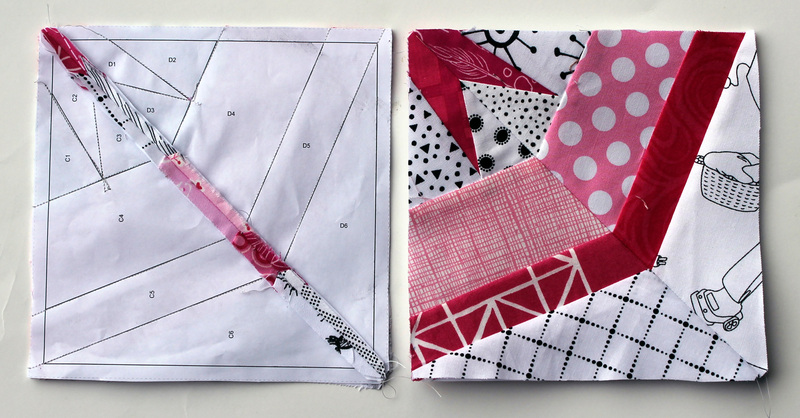 Yep they are having a girl…I wanted to do a quick, scrappy fun quilt for them using snowball blocks. I have designed five 12 inch blocks for this quilt and for a change, I have an idea of what the final quilt will look like! 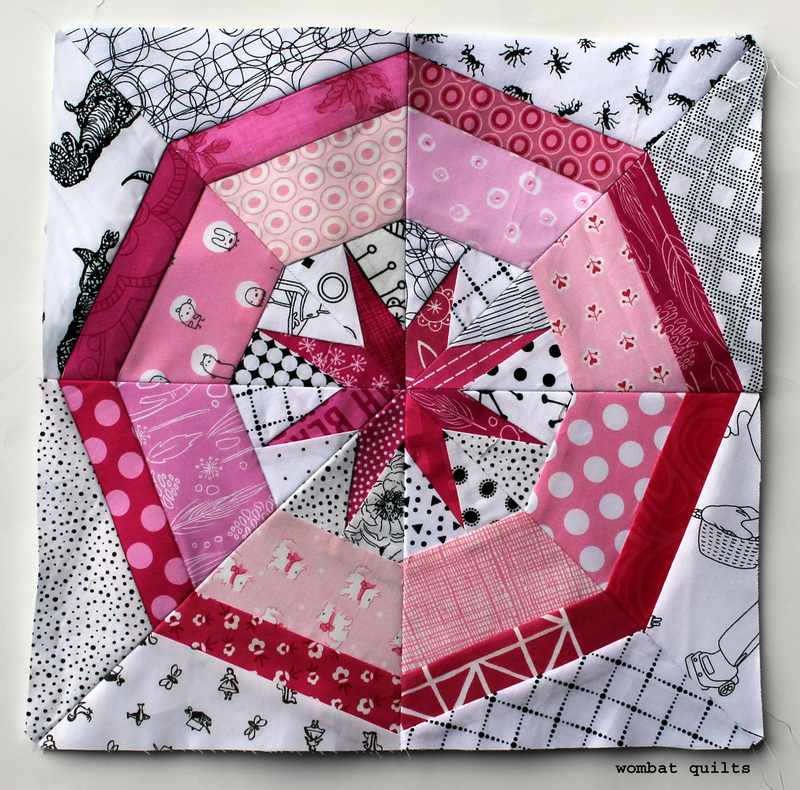 I hope you will indulge me and my love of pink over the following few weeks as I work to get this quilt done! I love this pattern and so do love the pink . Looking forward to seeing where this goes. This is fantastic! Beautiful. As much as I love green, I like this block even more. Great block! Tha pink is gorgeous with the low volume…Can’t wait to see the quilt when it’s finished! Thank you for sharing…. I do enjoy following along. Love the block. I might almost be tempted when my hand quilting is finished. Viv I am going to keep tempting you until you give in…. it is my cunning plan! I am hoping she does not get too scared by the dinosaurs! I so love your paper piecing projects and just wanted to thank you so much!! Not so much indulge your love of pink as fully encourage and egg on! I’m looking forward to seeing all the rest, as I shall be needing some 12″ blocks soon myself! I had to go back to my first love, pink. This just might be the project for me. I have been wanting to try paper piecing for awhile now. Plus I have been stash building lately and I have got carried away with the colour pink!!!! I love your colour choices. Must be the Queenslander in you! It’s a bit more drab here in Victoria! I definitely call myself a Queenslander… even now I am in the USA. I do think my colour taste and choices are heavily influenced by Australia…the intensity of the sun in QLD makes everything thing look loud and bright! I married a Queenslander and lived there for two years ( Atherton). I definitely noticed that people dressed brighter! That’s where I started quilting. Did I really say in a earlier comment “I really don’t like pink…” ? This is great!!!! Love especially your combination with that black/white. I made this block, but I reduced it to 33% to get a 4 inch block. It is a gorgeous block, but the center gets a bit bulky for all the points. I am still going to search for some good blocks to do in mini sizes. Lynn there are quite a few of my green star series that are great for reducing…they are a little simpler and do not have so many points meeting in the center.